Breakfast doesn’t have to be boring! 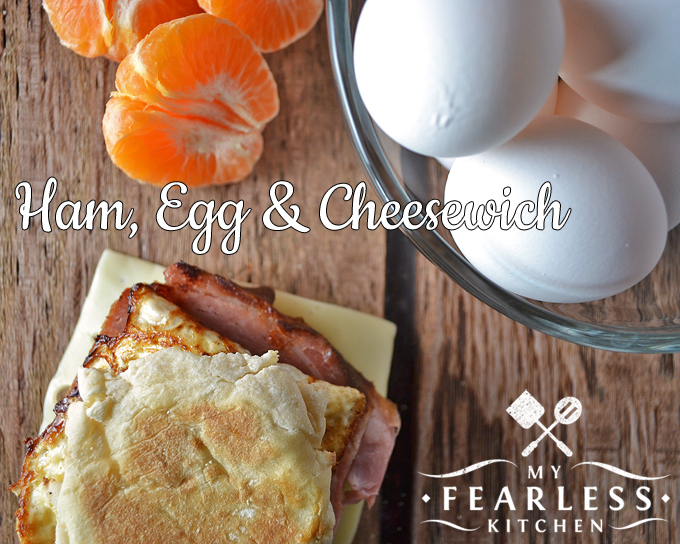 With this Ham, Egg & Cheesewich Breakfast Sandwich, you can make a fast, easy, and tasty breakfast in no time. I love a good breakfast. But with a toddler ready to eat now, and a serious caffeine deficiency first thing in the morning, I need breakfast that is fast – and super-easy – to make. Cereal and milk is all well and good. And slow cooker oatmeal is a staple for my mornings, but sometimes I’m looking for something a little more fun. And that’s where this breakfast sandwich comes in! Toasted English muffin, warm ham, melty cheese, gooey egg… what else to you need to make your morning happy? Other than a bottomless cup of coffee, that is! I adapted this recipe slightly from one I found in Gooseberry Patch’s Autumn in a Jiffy. And Jiffy is right! The only limiting factor is how well-done you want your egg cooked! I prefer mine over-medium, so the yolk is still just a little bit runny when you bite into it. Just make sure you have a napkin handy! If you want a non-runny yolk, you should cook your egg over-hard. Break the yolk when you first crack the egg into the pan. Cook it until the whites are no longer runny, then flip the egg over in your skillet. Cook it about 2 more minutes, until there is no more runny yolk under the egg. The hard-cooked egg won’t make a mess when you eat your sandwich! Do you have trouble making your fried eggs the right size for an English muffin? Try these egg rings. Just place a ring in your skillet and crack the egg right inside. It’s the perfect size! Or go one step further and try this breakfast sandwich maker! I haven’t tried it yet, but how easy does this look? Just toss all your sandwich ingredients inside and walk away for five minutes! 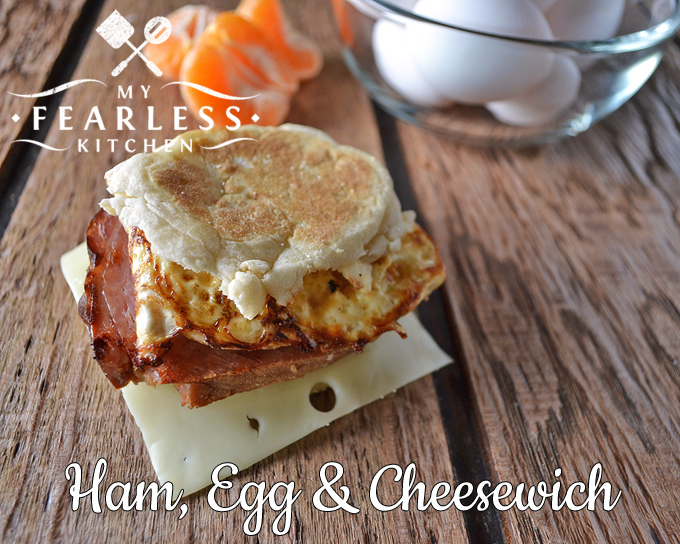 No matter how runny – or not – you like your eggs, this sandwich is a winner for breakfast! Save a few slices of ham the next time you cook one, and make this breakfast the next morning! Breakfast doesn't have to be boring! 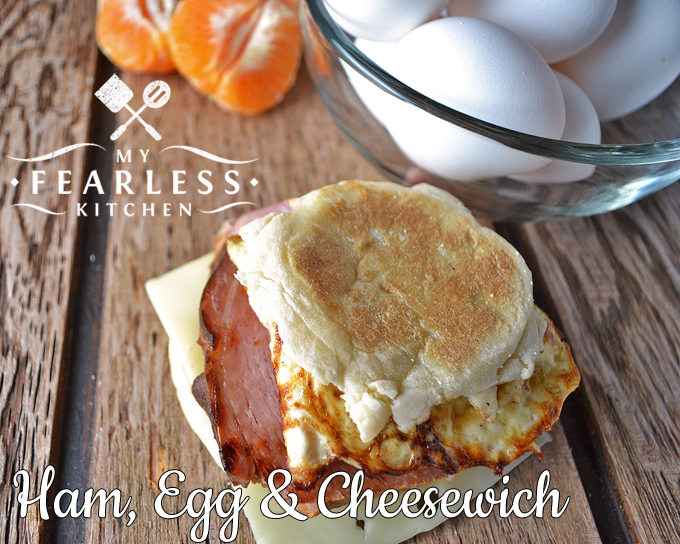 With this Ham, Egg & Cheesewich Breakfast Sandwich, you can make a fast, easy, and tasty breakfast in no time. Spread each half of the toasted English muffin with 1 teaspoon butter, and set aside. Melt remaining butter in a skillet over medium-low heat. Crack egg into skillet; break yolk (for hard-cooked egg) or leave whole (for over-medium or over-easy) egg. Season egg with salt and pepper to taste. Cook until egg is nearly set; turn egg over. Cook to desired doneness. On half of the English muffin, layer cheese and egg. Set aside. In skillet, heat ham for 30-60 seconds per side, until warm. Gently layer on top of egg. Top with the other half of the English muffin.